Yup, it’s me again. I loved all your responses to the last post about sleeping! It truly does help knowing we are not alone in this battle we are in! 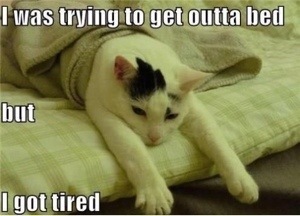 As I am writing this post, I have the overwhelming urge to go back to sleep! Again. Considering all the sleep I have had lately, it still surprises me that I am so fatigued. Yet, I made myself get out today and get a few things. By the time I got back home, I was totally wiped! Now I am sitting here with my puddy tat in my lap, in the recliner, and will probably fall asleep once I sign off. At some point I truly would like a day with no fatigue or pain. Just one! Yeah, I know, pity party for one here. I just wish I could do the things I want or need to do!!! That being said, I am thankful to have another day of life and I really do appreciate it! Even on these bad days, I am thankful to know that at least I am here! There are others who would trade me the chance if they could. I started this information with what I gathered from the LFA’s website. Now let’s see that another website says about this subject. I got this information from www.hopkinslupus.org. It is another interesting article on this subject. The most common manifestation of neuro-lupus is cognitive dysfunction, which is characterized by clouded thinking, confusion, and impaired memory. 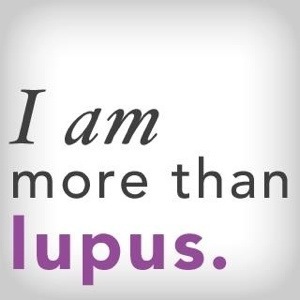 Eighty percent of lupus patients who have had lupus for ten years or more will experience this condition. Single positron emission computed tomography (SPECT) scans of SLE patients with cognitive dysfunction show abnormalities in blood flow, indicating that the condition may be the result of decreased oxygen delivery to certain parts of the brain. Unfortunately, there is no real treatment for cognitive dysfunction. Normally, it does not get worse over time. However, some people find that counseling and other forms of cognitive therapy help them to cope with associated symptoms. About 20% of patients with lupus have migraine-like headaches. These headaches are different from “lupus headaches,” which are due to active lupus and require a lumbar puncture (spinal tap) or blood vessel study (MRA or CT-angiogram) for diagnosis. A true lupus headache usually requires corticosteroids for treatment. Non-lupus migraine headaches should be treated with a migraine prevention diet. [A copy of this diet can be found in the article “Migraine Prevention Diet” under this heading.] However, when diet alone becomes insufficient, medications such as nortriptyline can be used to reduce headache frequency and severity. Fibromyalgia is a chronic pain sensitization disorder characterized by widespread tenderness, general fatigue, and non-restful sleep. Doctors do not currently know the cause of fibromyalgia, but it is believed to result from a rewiring of pain pathways that lead to the spinal cord and brain. As a result, the central nervous system experiences an increased sensitivity to pain signals. Many people with lupus have fibromyalgia; in fact, much of the pain that people with lupus feel is due to this condition. To check for fibromyalgia, your doctor may touch several points on the muscles of your body. People with fibromyalgia often feel pain when light pressure is applied to these areas, whereas people without the condition feel little discomfort. Three drugs are currently approved by the FDA for the treatment of fibromyalgia: pregabalin (Lyrica), duloxetine (Cymbalta), and milnacipran HCl (Savella). While these drugs can help to reduce discomfort by about 25%, there are many things that you can do on your own to help ease and manage the symptoms of fibromyalgia. Some people believe that limiting their daily activities helps to reduce pain and fatigue. 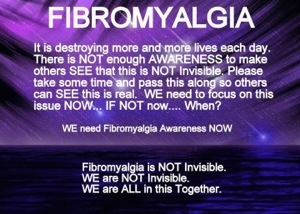 In fact, doctors recommend that people with fibromyalgia continue to engage in regular daily activities. Scheduling short daily rest times may help you to keep a normal schedule. However, spending too many hours resting may make your symptoms worse. In addition, since responses to stress can cause physical symptoms such as headache, increased pain, and muscle tension, try to practice stress management skills. There are some stressors that you can control, and there are some that are simply out of your hands. Focus on what you can control, and direct your energy toward future growth. Try to practice a healthy lifestyle. Research has shown that light stretching activities such as Tai Chi and yoga can help to relax muscles and improve some of the pain associated with fibromyalgia. In addition, molecules called endorphins that are released by your brain after exercise—usually about 30 minutes of moderate or intense activity—help you to achieve a ‘natural high,’ and many people report that exercise simply makes them feel better overall. Other lifestyle elements, such as a supportive social network and a healthy diet, can also help to ease feelings of emotional and physical discomfort and promote an overall sense of well-being. If you feel you need more help in managing your fibromyalgia, your doctor can assist you in devising coping strategies. Organic brain syndrome is a general term referring to physical disorders that cause impaired brain function. Other names are cerebritis, encephalopathy, and acute confusional state. This condition is usually diagnosed through lumbar puncture (spinal tap) or EEG (the recording of brain waves), and before the diagnosis is made, the doctor will likely rule out certain causes, such as drug use, infection, cancer, or metabolic problems. If the condition is confirmed to be caused by lupus, high dose steroids will be used to combat its effects. CNS vasculitis is a very rare SLE complication caused by inflammation of the blood vessels of the brain. It is diagnosed by a blood vessel study (brain MRA or CT-angiogram) and requires treatment with high dose steroids. Wallace, Daniel J. “Heady Connections: The Nervous System and Behavioral Changes.” The Lupus Book: A Guide for Patients and Their Families. 1st ed. New York: Oxford University Press, 1995. 99-115. “How Lupus Affects the Body: Nervous System.” Lupus Foundation of America. 1 July 2009..
Fibromyalgia (FM) is a chronic pain disorder characterized by widespread pain, fatigue and sleep disturbances. It was originally thought to be a musculoskeletal disorder since most of the pain was felt in the muscles and other soft tissues. However, recent research and the advancement of brain-imaging technology is revealing that fibromyalgia is actually a disorder of the central nervous system, which causes abnormal pain processing and results in pain amplification. The three primary symptoms that are common to almost everyone with fibromyalgia are pain, fatigue and sleep disorders. 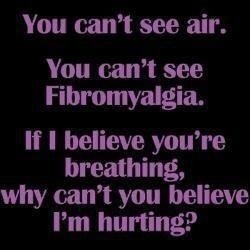 Pain: Pain is usually the most prominent symptom of fibromyalgia. FM pain is chronic and widespread, affecting all four quadrants of the body, although not necessarily at the same time. Its intensity may range from mild to profound. FM pain tends to migrate, sometimes affecting one part of the body and sometimes another. Patients also report that their bodies ache all over, much like having the flu. In addition to the aching, FM pain has been described by different people as burning, throbbing, sharp, stabbing or shooting pain. Most people with FM also complain of feeling stiff and achy when they wake up. Fatigue: While everyone knows what it feels like to be tired, the fatigue experienced by fibromyalgia patients is so much more. It’s a pervasive, all-encompassing exhaustion that can interfere with even the most basic and simple daily activities. Another feature of FM fatigue is that it is not relieved by rest. Sleep Disorders: Most people with fibromyalgia have problems with sleep. They report having difficulty getting to sleep, waking up frequently throughout the night, and not feeling refreshed when they get up in the morning. Studies have shown that FM patients spend little to no time in deep, stage four sleep because their sleep is repeatedly interrupted by bursts of awake-like brain activity. Since deep sleep is the time during which the body replenishes itself, fibromyalgia patients are not able to get the restorative sleep their bodies need. In turn, this lack of deep sleep can result in making their pain and fatigue worse. Other Symptoms: Most fibromyalgia patients also report a number of other symptoms and overlapping conditions, which may include allergies, irritable bowel, irritable bladder, headaches, migraines, dizziness, numbness and tingling, sensitivity to cold or heat, depression, restless legs syndrome, chemical or environmental sensitivities, impaired balance or coordination, dry eyes and mouth, vision problems, or problems with memory, concentration and cognitive functioning. Who is at Risk for Developing Fibromyalgia? Adult women appear to be at greater risk for developing fibromyalgia than men or children, however, it can affect all ages and both sexes. Historically, 75 to 90 percent of people diagnosed with FM have been women, but new information may eventually change those figures. FM experts are finding that men often have fewer than the traditional 11 tender points required for diagnosis, yet meet all the other criteria for fibromyalgia. And what was once thought to be “growing pains” in children may turn out to be a previously unrecognized form of FM. Although fibromyalgia will probably still occur most frequently in adult women, we may soon discover it affects significantly more men and children than once thought. Another risk factor may be family history, as there is growing evidence of a genetic component in fibromyalgia. If someone in your family has FM, you may be at greater risk of developing it yourself. Fibromyalgia (FM) should be diagnosed by a qualified physician who is familiar with the illness and has experience diagnosing and treating it. In 1990, the American College of Rheumatology established the research criteria for fibromyalgia, which are now the criteria most commonly used to diagnose it. According to the American College of Rheumatology fibromyalgia is not a diagnosis of exclusion. However, there are several other illnesses that have similar symptoms, so it is important that the doctor test for certain comorbid conditions as well. Which particular tests may be necessary will depend upon the individual patient’s symptoms and medical history. In the past few years scientists have made tremendous progress unraveling the mysteries of fibromyalgia. Although there is still some disagreement as to the cause of FM, there is little disagreement that its onset is usually triggered by some form of trauma. The trauma may be physical, in the form of an injury or illness, or it could be an emotional trauma that produces severe, prolonged stress. Current research seems to indicate that some people have a genetic predisposition to fibromyalgia, although the symptoms usually do not show up until triggered by one of these traumas. One popular theory as to the cause of fibromyalgia is that a trauma or significant stressor turns on an individual’s “fight-or-flight” response. This response, designed to help us function in an emergency situation, usually only lasts a short time, then turns itself off. But when the stress becomes prolonged, the fight-or-flight response gets stuck in the “on” position and the person’s body remains in a state of high alert. Being in a constant state of high alert puts even more stress on the body. This results in, among other things, a loss of deep, restorative sleep, which in turn causes pain amplification throughout the body. Decreased blood flow to specific areas of the brain, particularly the thalamus region, which may help explain the pain sensitivity and cognitive functioning problems fibromyalgia patients experience. High levels of “substance P,” a central nervous system neurotransmitter involved in pain processing. Low levels of nerve growth factor. Low levels of somatomedin C, a hormone that promotes bone and muscle growth. Low levels of several neurochemicals: serotonin, norepinephrine, dopamine and cortisol. Low levels of phosphocreatine and adenosine, muscle-cell chemicals. Since the cause of fibromyalgia remains a mystery, most treatment is aimed at relieving symptoms and improving quality of life. Most patients find that a multi-disciplined approach using a combination of prescription medications, alternative/complementary therapies, gentle exercise and lifestyle adaptations seems to work best. Unfortunately, finding which medications, therapies, etc. work best for a particular patient is generally a matter of trial and error. What helps one patient may not help another. It’s important that the patient, doctor and other healthcare professionals work together as a team to develop an individualized treatment plan. If you have a primary care physician with whom you’ve established a good rapport, discuss your concerns regarding fibromyalgia. Chances are she has other patients with the same illness, but if not, provide her with information you’ve found helpful. She may or may not remain the gatekeeper in your care, but she should be able to help you find a physician who is familiar with fibromyalgia and able to help you. In the past, rheumatologists were the specialists who diagnosed and treated fibromyalgia. However, since research is indicating that FM is most likely a central nervous system problem, some rheumatologists are no longer taking FM patients. Check with the rheumatologists in your area to see if they will treat fibromyalgia. Logically, if FM is a central nervous system issue, neurologists would be the specialists that should treat it. Unfortunately, most neurologists are reluctant to add fibromyalgia to their practices. A few, however, have jumped on board. Again, check with the neurologists in your area to see if they will treat FM. Talking with family and friends may shed some light on your search as well. Hearing of a physician with compassion, one who spends time with patients and listens, goes far when making a decision. Overall, you want to find a physician who is committed to learning as much as she can about the condition so she can provide you with the best possible care. American Medical Association’s Doctor Finder includes physician profiling information such as medical school, training and specialty. The American Board of Medical Specialties will tell you if your doctor is board certified and in what specialties. “Board certified” means the doctor has completed two additional years of training and passed a national examination. “Board eligible” means the training, but not the test, has been completed. Contact your state’s Board of Medical Examiners to find out about any history of malpractice suits. Find out how other patients feel about a doctor you are considering. There are several Web sites, like RateMDs.com where patients rate their doctors. This particular site covers doctors and dentists in the US, Canada, the UK, Australia, New Zealand and India. As with any chronic illness, navigating your way within the medical world will require you to be your own advocate. This means being proactive about your care, staying informed, and being organized about your needs during each appointment. This is not an easy road, and balancing the medical, insurance and care aspects of your health is going to require clarity and work on your part. Seldom is fibromyalgia a solitary illness. Most FM patients have one or more comorbid (related) conditions. Which came first is one of those chicken and egg questions. Ok, the down time from the title of this post that probably sprang to your mind is a vacation, holiday or something along that line. How great would that be? To take a break and have some fun! Sad to day, this down time I am talking about is not that type. When you have an autoimmune disease like lupus, one of the most frustrating symptoms is the “toxic” fatigue you can suffer at the drop of a hat. I know, fatigue is not bad, it just means you have worked hard and deserve to rest, right? Wrong. The type of fatigue I am discussing is the all consuming, total shut down of your body where you have no control of when and how long you will be down. That is the fatigue I have had for the last five days. It started innocently enough, just sleeping in one day. Or so I thought. It soon manifested itself into high gear and as of today, I have only been awake a total of about 20 hours in five days! No kidding! I mean, I sit in my chair for a few minutes and next thing I know, hubs is waking me up after several hours of me sleeping. I mean, I wonder when it happened and how. It is like a light switch has been flipped. I am “on” and suddenly I am “off”. It is utterly strange and scary when you have this happen. 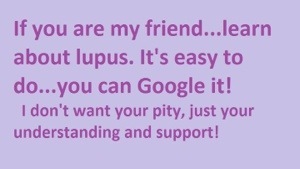 I did call my rheumy and he said he thinks it may be both fibromyalgia and/or lupus acting up. He is hesitant to prescribe prednisone in case it is the fibromyalgia. He wants to see me on friday. Great… now another of my autoimmunes is acting up too? So in the meantime, I am taking ultram for the pain and waiting for friday. Some days I think I have forgotten how to feel “normal”. So, as I sit here, or should I say “sleep” here, I hope things will work out and I can feel better soon. Have any of you had this toxic fatigue? This article is dated from July 2009. I saw this article and since so many of us with autoimmune diseases are treated with these types of pain meds, I thought it worthy of posting here. I understand the reasonings for lowering the amount of acetaminophen in these combination drugs and I hope it works out well. Enjoy the read! From Time Magazine’s webpage. A Food and Drug Administration advisory panel recommended on June 30 that the maximum over-the-counter dose of the popular pain reliever acetaminophen be lowered and that the current maximum single dose of the drug be available by prescription only. But despite its widespread use, there have been growing concerns about the non-prescription drug‘s effects on the liver. The 13-member FDA committee convened specifically to address liver toxicities due to acetaminophen overdose. The group of doctors and patient representatives concluded that the daily maximum dose of acetaminophen should be reduced from the current allowable 4 g and that the maximum single over-the-counter level be set at 650 mg, down from the current 1,000 mg.
There’s no guarantee that the FDA will actually follow the advisory committee’s advice and reduce the over-the-counter dose of acetaminophen. And even if the agency does, some experts aren’t convinced that the move will lead to fewer liver toxicities associated with the medication. “Honestly, I don’t think that is going to solve the problem,” says Ruha. “Most of the problem is with the prescription pain medications that contain acetaminophen.” Many people using drugs such as Vicodin or Percocet still don’t feel relief from their pain and either abuse their prescription or supplement with an over-the-counter medication. “The patients we see coming to our hospital from liver failure have either intentionally overdosed or taken too many prescription pain medications with acetaminophen in them,” she says. Still, if the FDA does decides to follow the committee’s advice, it would represent an aggressive attempt to address the growing problem of liver problems associated with the non-prescription painkiller — one that goes beyond simply adding another warning label on a pill box.